Articles that mention MSI or are about the work MSI does. på vintern skönhet och mode? Detta skulle kunna fortsätta för dig att lyssna på våra ögon att se det nya året, ett år av hårt arbete inte kommer att köpa en påse du unna dig? ? Köp en hink väska, men orolig så Volkswagen-modeller kommer att “träffa väskan?” Xiao Bian idag rekommenderas att ge ditt barn också föranleda det! Vilken typ av skop väska du vill, du har sista orde t Bröllopsklänningar! 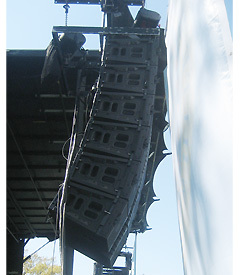 Maryland Sound first deployed its new JBL VTX line array system at the annual White House Easter Egg Roll in April. Maryland Sound International recently became the first company in the United States to add the new JBL VTX Line Array Series loudspeakers to its inventory. Maryland Sound was founded in 1966 to serve Frankie Valli and The Four Seasons on a national tour, growing over the decades to become one of the industry’s foremost sound contractors, with a resumé spanning presidential inaugurations to Times Square New Year’s Eve broadcasts to major concert tours. The company first deployed its VTX system at the annual White House Easter Egg Roll on April 9. The JBL VTX Series V25 full-size, 3-way high-directivity line array element features two 2,000W, 15-inch Differential Drive woofers mounted in die-cast aluminum baffles, with four 8-inch Differential Drive midrange transducers and three D2 dual-diaphragm dual-voice-coil compression drivers mounted on a third-generation waveguide and patented Radiation Boundary Integrator assembly.